Call me insensitive to a culture's need for this to exist. There are a lot of things that people are in to that I do not get (in addition to plenty of things I'm into that most people don't get). I will never understand the need (is it a macho thing?) to "eat" dishes that have cultural claims towards mysticism, virility and the link. Not to rationalize it, but there really isn't any evidence that Shark Fin soup does....anything. To get even further off the point, it supposedly is bland and pretty forgettable. Back to the topic at hand, check out the picture below (Warning, graphic content). 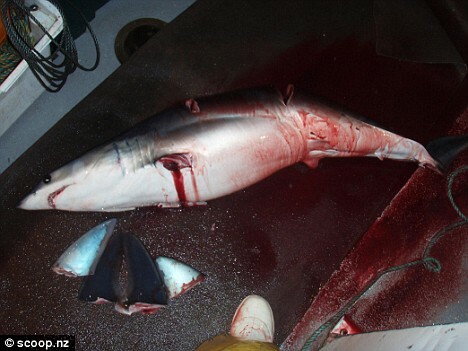 A shark whose fins were cut off while it was still alive. While still alive and bleeding profusely, this shark will then be thrown overboard to die via drowning (it can't swim without fins) or blood loss, whichever comes first. Due to this centuries-old horrific practice, many species are on a straight path toward extinction, including but not limited to the Great White (Pointer), Porbeagle, and Oceanic Whitetip. a deep water/pelagic shark known for its huge fins, a favorite of Shark poachers. Since 1986, hammerheads have declined by 89 percent. What species can honestly survive that amount of sudden loss?